The popular Cherry Lake Cottage is ideal for larger groups of 2-3 couples as well as families. As well as having three large bedrooms (two with double beds and one with either a double or two single beds) and two bathrooms, it also has a large lounge and dining room. Best of all it has it's own exclusive large hot tub. There can be few things better than sitting in the hot-tub listening to the River Churn as it goes over the nearby weir. 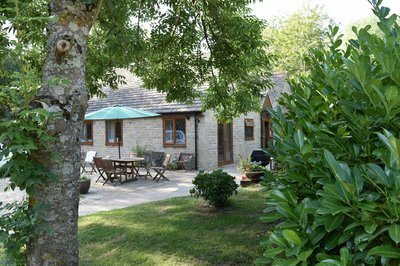 The Cottage has it's own private patio, with a large garden table and chairs. It is the perfect place to enjoy the sunset while having a BBQ and a glass of wine! The patio area is also close to the large Cottage swim. In short it is a great place to spend both a short break and a longer holiday. Why not watch this short video to get a quick tour of the Cottage. The Cottage has everything you would expect of a 'home away from home'. The fully fitted-kitchen which was updated in January 2018 is fully equiped with a dishwasher, microwave, electric cooker and gas hob. It also has a washer/dryer, all to make self-catering as pleasurable as possible. Should you prefer not to cook in the kitchen, you can either BBQ outside, or take advantage of the local Indian, Pizza and Fish and Chip takeaways. 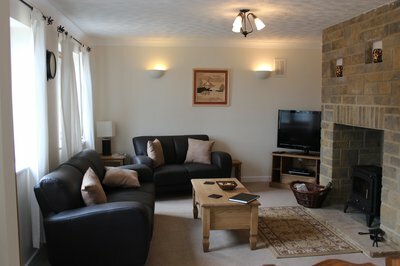 The Cottage has a large lounge with an attached large dining room which has a table which comfortably seats 6 people. The log burner in the lounge is a delight during those cold winter nights. Between October and April, we supply free baskets of logs. All you have to do is light the fire and watch the large 50'' Smart TV and Blu-ray/DVD player! Wifi is also available if needed. The Cottage also benefits from two bathrooms. The recently remodelled main bathroom has a large walk-in shower as well as a bath. The second bathroom also has a shower. The Cottage has three bedrooms. Each with a large wardrobe and drawers. Two of the bedrooms have a double bed. The middle bedroom can either be set up with two single beds or one king-size double bed. The outside areas of the Cottage are almost as good as the inside! The Jacuzzi hot tub is a great place to unwind. What could be better than sitting looking at the stars, listening to the weir on a cold night? 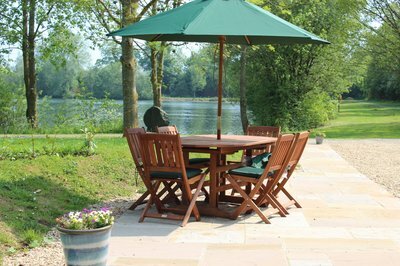 The Cottage patio area is a popular place for guests to gather, particularly when having a BBQ or even breakfast! The Cottage patio great for BBQ's, wine and lake watching! 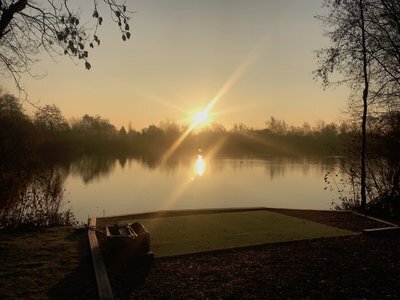 The Cherry Lake record Carp of 44lb was caught from the Cottage swim and at least three anglers including Paul Silence pictured here have caught 3 x 30lb+ carp whilst fishing from this swim.